A new photography gallery has been introduced at the National Museum of Wales in Cardiff, and to launch it, an exhibition of photographs from the vast David Hurn Collection is on display. Thomas Babington Macaulay, the eminent British historian and politician, when referring to John Milton wrote, ‘[his words] are words of enchantment. No sooner are they pronounced, than the past is present and the distant near… and all the burial-places of memory give up their dead’. The same could be applied to documentary photography and its cousin photojournalism. We all know that memory plays tricks. At 9.15. am on 21st October 1966, a huge piece of water-saturated debris accumulated from a century’s heap of coal spoil, descended upon Pantglas Junior School and other buildings in the Welsh village of Aberfan. In the aftermath, 116 children and 28 adults had perished, victims initially of the greed and indifference of the original mine owners, and latterly, the National Coal Board. As a ten-year old boy, (the same age as many of the victims), this had, and continues to have, a profound influence on me. “There by the grace of God” is an appropriate thought. At the exact time of the disaster, I was seated in my classroom, safe and sound in an environment that all children should feel at school, only separated by the Brecon Beacons from Aberfan. 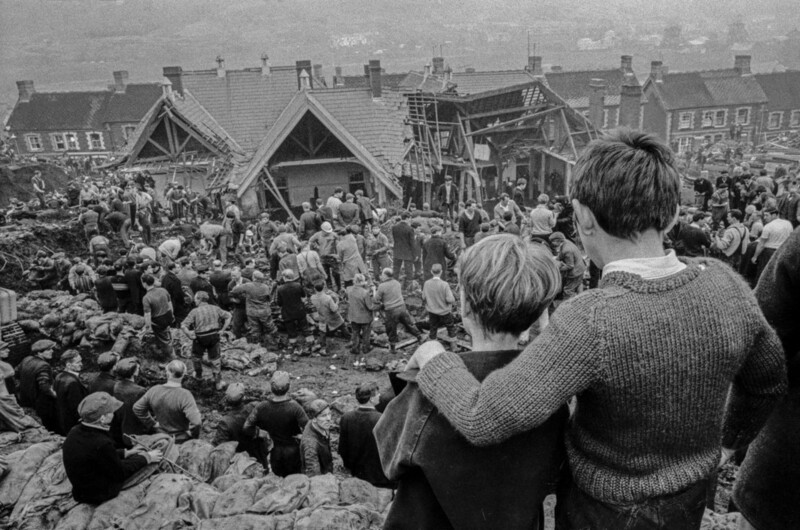 I remember passing through Aberfan the following evening, returning from Cardiff, and seeing the floodlights set up for the rescuers in an ever-diminishing sense of hope of pulling out any of the victims alive. Was it my mother, or a friend of my mother’s, who came across an obviously distressed elderly lady in recon market, who after enquiring if she was alright, said that her granddaughter was a young student at that school. The unreliability of memory. 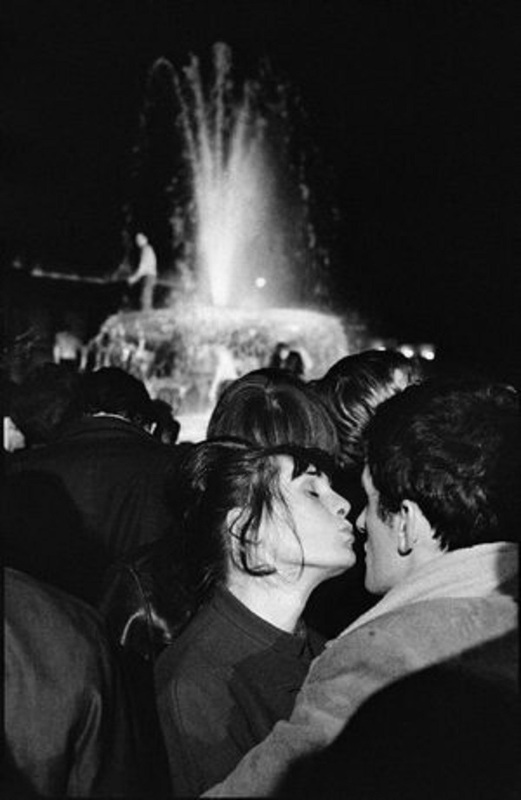 David Hurn, an established 32-year old documentary photographer at the time, felt that he had to be there. Not only to capture the scene, but to try and portray the anger felt by so many, as to why this tragedy occurred. The sombre scene, heightened by the grim realism of using back and white film, gives a very strong message. Two schoolfriends look down at the scene of the disaster, with, (possibly the elder one) having his arm placed around the other. Are they brothers? Are they classmates of some of the victims, coming to terms with the realisation that they won’t ever see their friends again? Does it also show the strong bond of community, prevalent in the Valleys of South Wales to this day? An “us against the world” mentality, which would be a very suitable and understandable feeling after what had happened here. 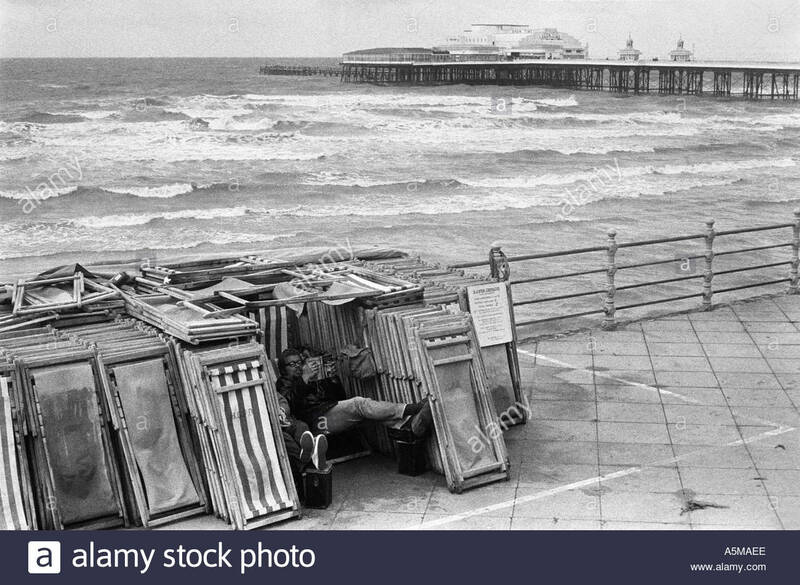 Is this a spontaneous photograph, or did David Hurn set it up as a composition? Documentary photographers rarely do this, so I would expect Mr. Hurn to answer in the negative. Does it really matter if he did, because for me, it neither degrades or elevates the power of this photograph. How can the viewer look at it, in terms of memory? Possibly as a revenant, a ghost-like spirit returning to this exact time and place, or as a stranger, going back to an area that he/she once knew, but alienated from it through the passage of time and physical difference to the landscape? At this point, I should point out that this photograph does NOT appear in the exhibition currently on display at the National Museum of Wales. 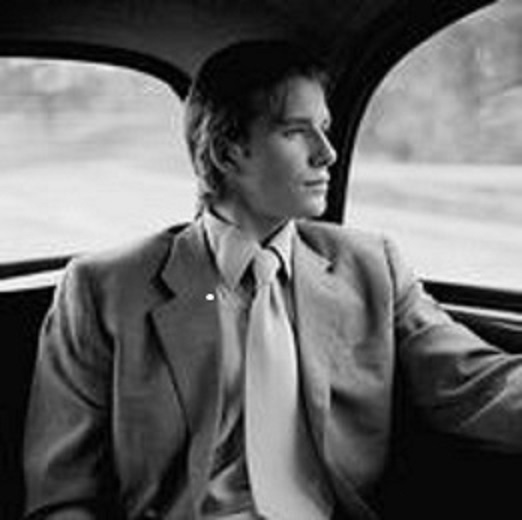 David Hurn, although born in Redhill in Surrey, eight two years ago, is considered to be a Welsh photographer. Brought up in Cardiff, as a young boy he paid a considerable amount of time visiting the Art Galley of this wonderful museum, and it left a very strong mark on him, because earlier this year, he donated two fabulous collections. 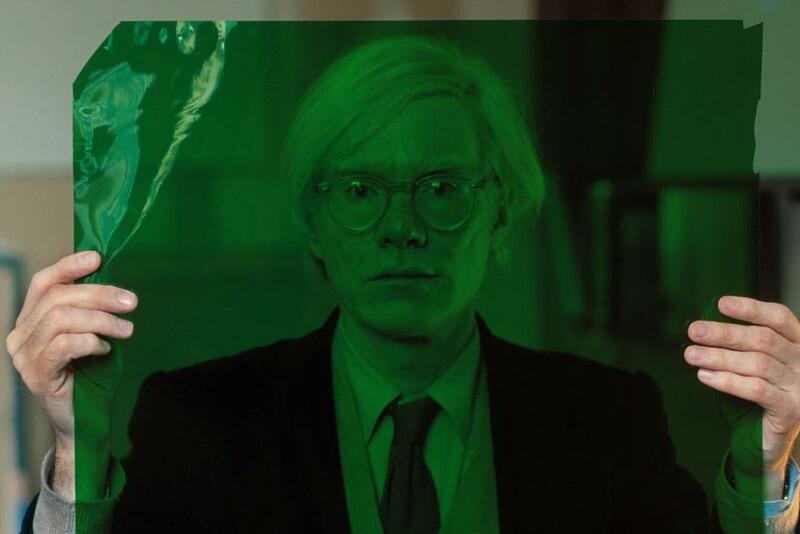 The one, amounting to around 1,500 of his own work and the other, the subject of this exhibition, prints that he had swapped with other photographers whose work he admires. The photograph above does from part of the donated body of his own work, and I enquired with Bronwen Colquhoun, the recently appointed Senior Curator of the Photograph Department at the NMW, as to whether, at some time, it will be on display, and she answered in the affirmative. 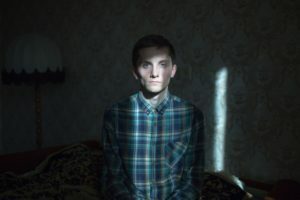 The reason why it appears in this review is to hopefully illustrate how powerful an image of documentary photography can be. All other photographs that appear here, do form part of the exhibition. The display is located in one large room and is set up in such a way, (although it is not readily apparent to the viewer unless they are very well acquainted with David Hurn’s collection of swaps), that it forms a logical pattern. 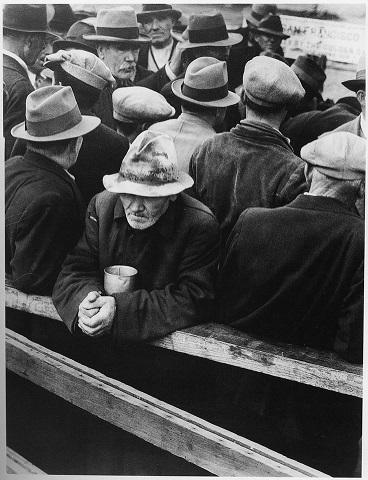 The starting point should be a photograph that David Hurn, as an unknown photographer acquired from the already famous Chilean photographer Sergio Larrain. David was photographing pigeons at Trafalgar Square in London in 1958, when he was approached by another photographer doing the same thing. This photographer turned out to be Larrain, someone who David hugely admired at that time, and continued to do so, after forging a strong friendship, until the Chilean’s death in 2012. David couldn’t believe his luck. Not only did he gain the opportunity to meet one of his idols. Sergio was very complimentary about the way that he was going about taking his photographs. Over a coffee, Sergio told David that he felt that he had a future ahead as a professional photographer, but he felt a little skeptical, as he preferred to capture everyday life rather than important newsworthy events. After admiring some prints that Sergio had taken, he was given some of them as a gift, a very unusual occurrence at that time. So, this is where what has become a collection second to none, and valued at over three and a half million pounds. The question as to whether the result is either a spontaneous shot or contrived, doesn’t come into question with the next photograph that I am referring to, that is, unless they super-glued the bird’s feet to the ground. 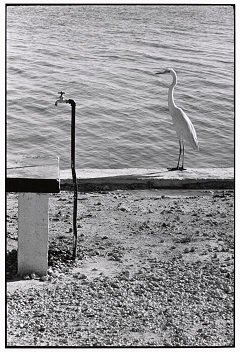 Erwitt is known for his ironic and absurdist photographs and the humour in this photograph is there for everyone to see. It illustrates the opportunistic nature and photographer’s eye to perfection. 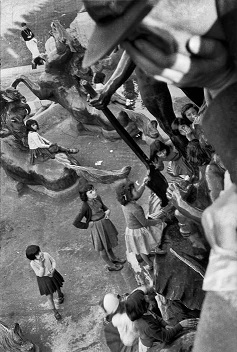 Henri Cartier-Bresson is regarded as one of the great photographer in history of candid shots. 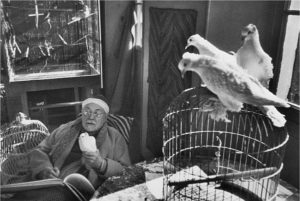 In the next photograph, we see such a print of the French modernist artist Henri Matisse, holding and surrounded by doves. 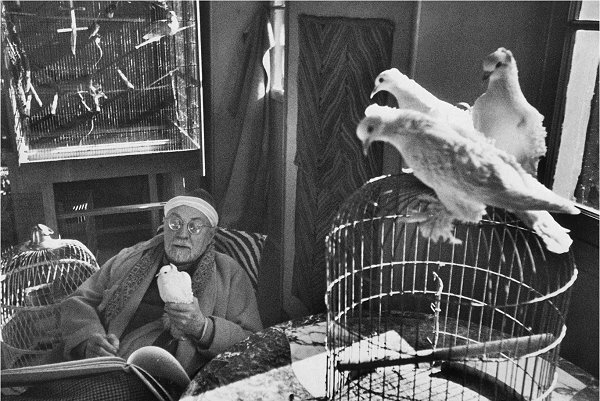 The peace and tranquility that Cartier-Bresson captures is almost poetic. It used to be considered for a photographer to sign his work, a rather pompous act of self-grandeur. This print has a dedication, “for David H l’ami Henri C-B” a method sometimes used to get around this signature problem. Cartier-Bresson was another photography who David greatly admires. When the Frenchman visited David’s flat to view some of his prints, it was almost if God himself had walked in, he recollects in a filmed interview. As David’s fame increases, he became braver in asking photographers to swap prints. This is exactly what he did when he approached Dorothy Lange on a trip to the US. Lange you may know, is famous for her “dust bowl” photographs taken in the American Prairies at the height of the Great Depression. Her iconic photography “Migrant Mother”, perhaps more than any other image, eipitomises this period of American history, also immortalized in John Steinbeck’s, “The Grapes of Wrath”. The grimness of this time is captured in this photograph that Dorothy swapped with David. You see a shabbily dress middle-aged man, (maybe wearing his only clothes) facing the camera and a group of other men turned the other way around. The man is clutching a mug. Could this be his only procession? The photograph gives the impression of resigned hopelessness. The other figures possibly representing how society has turned its back on the subject of this image. As you enter the room, if you turn your attention to the left side wall, you will see a small group of photographs that represent photographers who started out the same time as David trying to establish themselves in a highly competitive market. 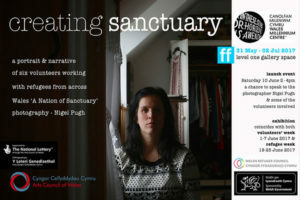 These people and David used to get together in coffee bars in London in the 1950’s and offer critical opinion, and offer support to one another. 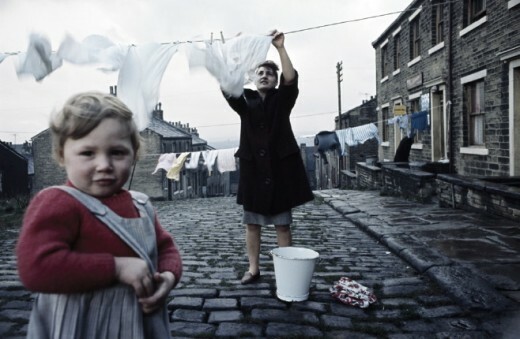 The photos on view represent the work of John Bulmer, Patrick Ward, Ian Berry, Philip Jones Griffiths and Sir Don McCullin. On the Internet, this colour photograph has a different title “Woman Hanging out Washing) Tipton. This town is Halifax. 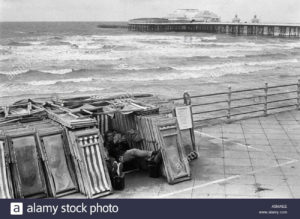 This photograph taken on a windy day in October with the waves crashing in and a deck chair attendant taking shelter from the wind by surrounding himself with his hirable goods reading a book. Blackpool pier is in the background. 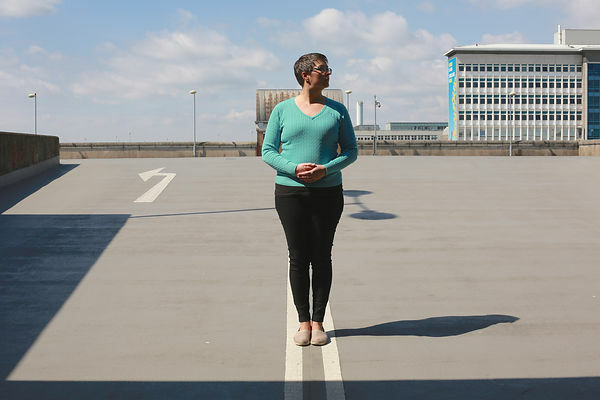 Is there anywhere more desolate than a British seaside resort out of season? For that matter, in season also! Ward captures this feeling, and you can’t help wondering, why is this man bothering? Perhaps he has no choice. The pursed lips of the young lady in the foreground asks, is she just about to do the kissing or is she waiting for her partner to kiss her. Berry was the only photographer to capture the massacre at Sharpeville, but here we see him capturing an intimate scene in happier times. This image shows a Vietnamese woman tagged with the designation VNC (Vietnamese civilian). This powerful photograph suggests to me the degradation and reduction of the value of humanity, labelling in such a way that you might do with a suitcase or an exhibit in a museum. Jones Griffiths, a fellow Welsh photographer made his name covering the Vietnam War. 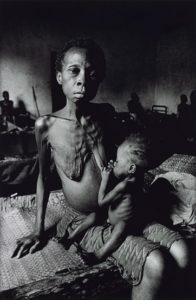 This poignant photograph shows a young twenty-four-year-old woman with a suckling baby who is looking for milk that she can’t obviously provide through the emaciated condition. David comments on this photograph by describing this woman’s dignity of expression. You feel that if anyone can get through this and come out on the right side, then she is that woman. He also compliments the skill of his friend Don by saying that the trust that the subject has for the photographer is exemplified by the fact that she is looking directly at the photographer, allowing such an intimate portrait to be taken. 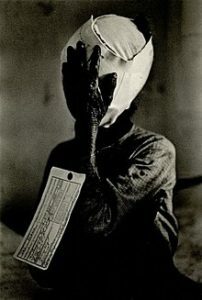 In 1965, David was asked to apply for membership of Magnum Photographs. This commercial body was founded in Paris in 1947. 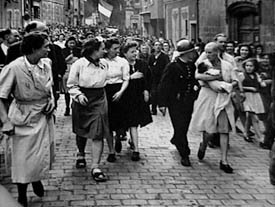 Among the co-founders were Henri Cartier-Bresson and Robert Capra. The latter you may recall took arguably the most powerful image of war, “The Falling Soldier” taken during the Spanish Civil War. Capra, whose life was tragically cut short at the age of 40, when he stepped on a land-mine during the First Indochina War, in 1954 swapped this photo with David. What struck me about this photograph is the stark image of the baby, tenderly being held by this mother, on contrast to the hatred and derision of the crowds. Innocence the Baby versus. War -Hatred as a result of conflict. Magnum Photos is still flourishing today and provides a marketplace for photographers who was members to sell their work. It also, according to Cartier-Bresson is “ Magnum is a community of thought, a shared human quality, a curiosity about what is going on in the world, a respect for what is going on and a desire to transcribe it visually”. The criteria for membership is strictly enforced and passes through two stages – Associate and Full Membership. David became an Associate member in 1965 and a full member two years later. As you enter the exhibition, you are greeted by a huge number of photographs, all taken by members of Magnum Photos. Photographers such as Eve Arnold, Martin Parr, Peter Marlow and Thomas Hoepker to name a few. The stark black background accentuates the tender and intimate touching of a baby’s tiny fragile hand. A photograph that touchingly shows the unique bond between mother and child. 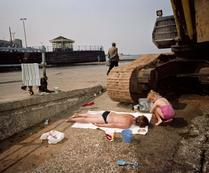 Martin Parr, another long-term friend of David, took a set of photographs depicting the Wirral seaside resort of New Brighton, once a prominent location for day-trippers and tourists to the town, now in a state of decline, but still having an active scene. A candid photograph of a relaxed looking David Beckham at the height of his pomp. One of a set of quirky photographs taken in NYC of this iconic subject. 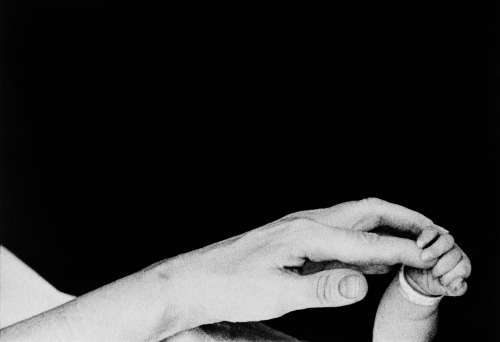 In 1973, David turned to teaching and founded the School of Documentary Photography in Newport, Gwent. A section to the right of the room is dedicated to some of his students who were able to forge successful careers in photography. 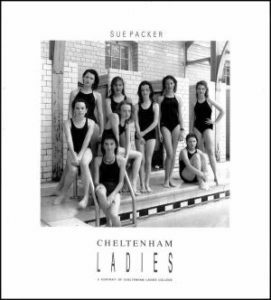 A photograph that particularly interested me is by Abergavenny-born Sue Packer and adorns the cover image of her publication, “Cheltenham Ladies – A Portrait of Cheltenham Ladies College. There are no smiling adolescent young ladies here. In fact, you could almost accuse them of being sullen in some instances. Is this a statement of the difficult road ahead of them, possibly as females when setting out on their careers? Cheltenham Ladies College is one of the most prestigious public school institutions for girls in England. Does their privileged backgrounds account for their provocative expresses? Could it be a sexual provocation? 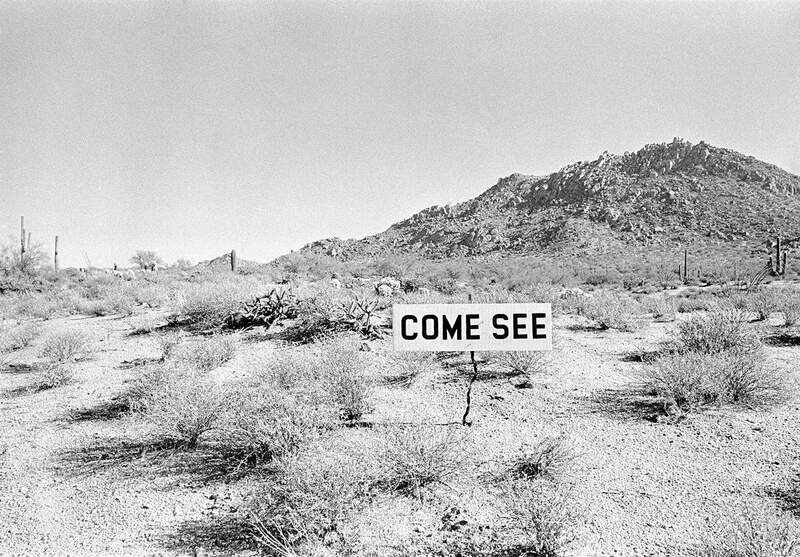 It is an intriguing photograph and not difficult to see why it has been the subject of a David Hurn swap. David’s reputation is such nowadays that to be asked to swap a photograph with him, is a testament to your own arrival as a photographer of renown. Although the exhibition is not about photographs that David Hurn took himself, Bronwen Colquhoun managed to persuade him to include three of then. In order to tie in with the theme of the exhibition, these photographs are the ones that David is asked to swap himself. 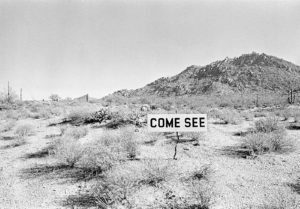 Taken from Arizona Trip, a forthcoming publication, (November 2017), of a collection of photographs that David took at the back end of the 1970’s in that state. 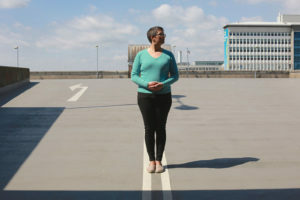 The photograph captures a landscape that will be eradicated when building developers move in shortly after it was taken. This magnificent collection of 700 + swaps, many which are presented in this exhibition is a remarkable coup for the National Museum of Wales. In his own words, David says that he only would donate these collections if the NMW started its own dedicated gallery for photography. Photograph galleries are a relatively recent feature, beginning in the late 1960’s as purely commercial enterprises. Galleries in terms of providing a viewing platform for the pleasure and education of the viewers came later, but it is still a little surprising that it has taken the NMW so long to set up its own gallery. 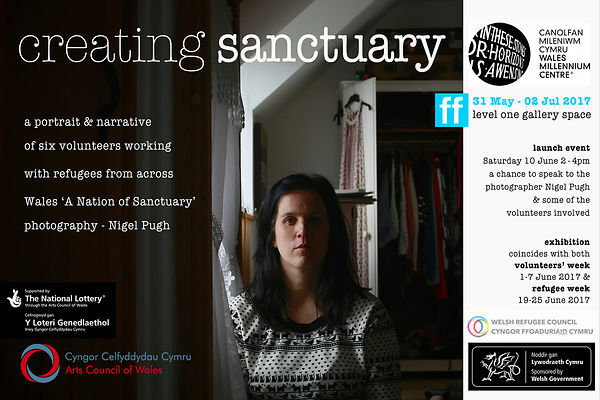 Bronwen Colquhoun says that the intention is for exhibitions to change at roughly six-monthly intervals and drawn from a rich treasury of photographs showing Welsh cultural, historical, industrial and social life. The David Hurn Swaps Collection is the perfect instrument to kick-start this important new feature at the National Museum of Wales. David Hurn will be conducting a talk about the Collection at the museum on the 20th October 2017. Admission is free, but I have been informed that it is advisable to book now to avoid disappointment as demand has been very high.